SUPPER BRILLIANT POINT? helps quality of the students in developing command over the basic fundamentals, concepts, and principles of various subjects through detailed problem solving. A correct interpretation, evaluation and analysis of the types and range of problems while they attend any competitive exams.i.e. BANK PO, BANK CLERK, IBPS (CWE) ,SSC (CGL, LDC, UDC, DEO, FCI), NDA, CDS, AIR FORCE, NAVY, ARMY, MERCHANT NAVY,CRPF, BSF, ITBP, SSB, DELHI POLICE, HARYANA POLICE, U.P. 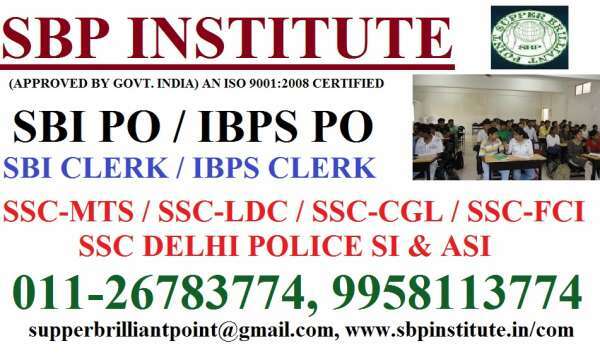 POLICE, SUB-INSPECTOR, UPSC (SCRA) , DSSSB, PGT, TGT, CTET(CWE), B.ED, B.EL.ED, POLYTECHNIC and others competitive exams. We aim to provide the teaching methods of ?SUPPER BRILLIANT POINT? trains the students to think logically and give them a systematic approach to solve their writing problem. This is made certain stimulating atmosphere of the coaching centre, optional batch size and one to one interaction with the teachers. The course material provided captures the essence of each concept effectively. Our vision a conductive and congenial environment is maintained at the centre of ?SUPPER BRILLIANT POINT? to make the process of learning faster and easier. The classrooms are airy and healthy atmosphere, comfortable and equipped with the latest teaching aids.